Trevor Costa joined Berger Piepers in January 1999. 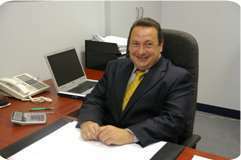 Trevor is an associate with Our Firm and is responsible for most audits conducted by Berger Piepers. He employs a hands on approach to the Firm's audits which best positions us to identify and assist our clients in rectifying any deficiencies or problems which may be encountered in an effective and timely manner. Trevor reports directly to the Firm's Partners and is supported by a team of senior, intermediate, junior accountants and consultants as required. Trevor gained his experience over a period of eight years with Ernst & Young where he held the position of Senior Manager-Audit and Corporate Services. He then spent a period of eighteen months as Financial Controller of a large multinational organization. This experience enables him to assist clients in dealing with any day-to-day issues they may encounter. Cash flow budgeting and forecasting, including advising on business and capital acquisitions.